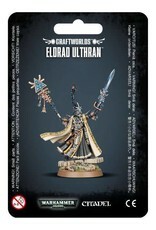 Eldrad Ulthran was once chief amongst the Farseers of Ulthwé. Eldrad has lived for over ten thousand years, and has successfully guided his people along the twisting paths of fate since the Fall, and throughout the rise of the Imperium. Time and time again, Eldrad has averted disaster for not only his former craftworld, but the entire Aeldari race, committing acts of heroism hidden within severed strands of fate, regularly offering sage wisdom and tactical aid to those who fight against the overwhelming forces of Chaos that beset the galaxy. 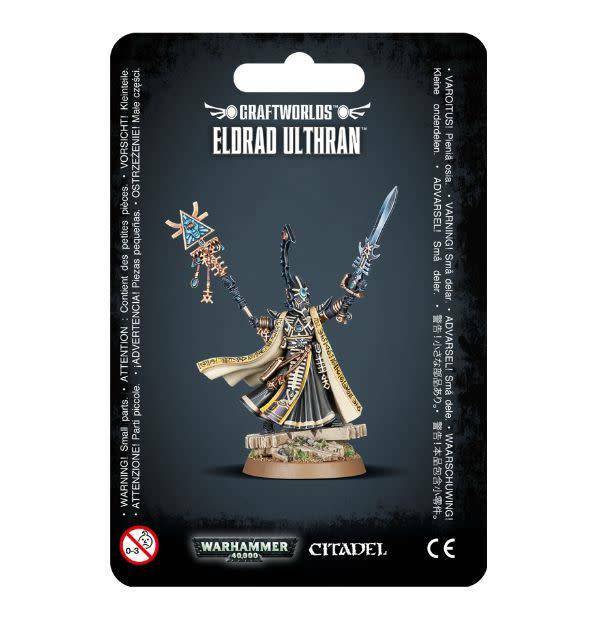 This multi-part plastic kit contains the components necessary to assemble Eldrad Ulthran. Standing tall, wielding a beautifully-jeweled witchblade and the Staff of Ulthamar, he wears impressively elaborate armour reflecting his status as high Farseer. Patterns of psycho-receptive wraithbone runes are secreted about the model – Eldrad is said to have devised over a dozen distinct runes. Even his billowing cloak is inscribed with runes, demonstrating his psychic might – as a backup, should his psychic abilities fail, he carries a shuriken pistol also. This kit comes as 13 components, and is supplied with a Citadel 25mm Round base.